Time. It is a dwindling resource. There is never enough of it. It’s gone immediately and can never be retrieved. It is one of those things we all want more of, but in many cases, it is a problem of time mis-management. Some people get it and have everything organized and planned down to exactly how many brushes on their teeth and how long it takes to do it. For others, effectively planning and organizing themselves is as simple as herding billy goats. Time management skills just do not come naturally to them. These individuals start each day with an idea and the best of intentions. Perhaps some of their time is eaten away by things out of their control: a traffic jam on the way to work or a meeting that ran over. It could however be self-inflicted; an extra five minutes chatting while getting coffee or that last smoke break in the afternoon. Prioritize: It seems so simple but it is amazing how often this is forgotten. Each day and/or each week should start with a list of everything that needs to get done. The items on that list should then be put in order of importance (or deadline). As new tasks or projects come up, analyze the current list and prioritize accordingly. This priority list will help keep you on track and keep you from missing those important project deadlines. Create Goals: Setting up goals or routines is one way to keep that priority list in line. One goal may be to not check or answer email until just before lunch and/or before the end of the day. You can hold all calls while you prepare for that big meeting. You can use it in your personal life too. Propose to throw a load of laundry in every morning, put it in the dryer when you get home and fold it while watching your evening television. A move like that can free up a whole weekend. Delegate: As an owner or manager, you may feel that in order to get something done, you must do it yourself. Every person cannot be everywhere and do everything. You have a staff, even if it is an employee or two. It is time to start using them to the best of their capabilities. If you have not begun to train any of your employees in certain things, there is no time like the present. It helps their confidence and makes them feel more invested in the company and you can take some things off of your plate. There’s an App for That: Smartphones these days come with an amazing amount of abilities. Calendars are just a small piece of the type of time management tools available. The great thing about using these phones for this is that you always have them. You don’t need to check in your office or carry a bulky book anymore. Just Say No: There is only so much one human being can do. Being on the board of this non-profit, and the chair of this committee, and also working on this project and that initiative is commendable, but it can also be career suicide. Your boss or client will not remember all the great things you were involved in, but instead just the one thing they cared about that you messed up because you were not focusing on what they really needed. Lack of organization creates a tremendous amount of undue stress on many individuals. With just a few time management skills, they may gain a bit of their life back. One should not overwhelm themselves though. Try one of these at a time, or a combination of a few. Find what works best and stick with it! Six months from now, you will look back and be amazed at the difference. 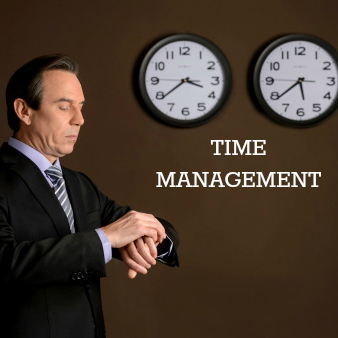 Do you need work on time management? How so? Leave a comment!